Argentina a year before its independence from Spain. Chili La Plata and Uruguay. 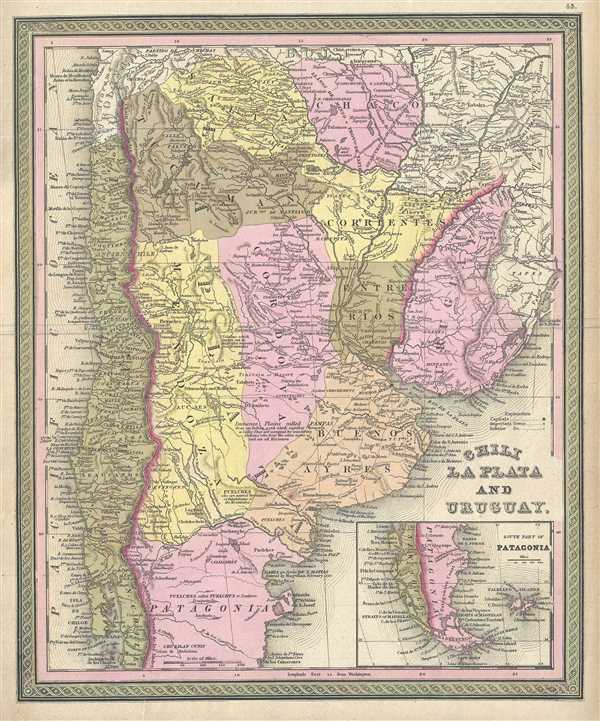 This is a lovely example of S. A. Mitchell's 1849 map of Chile, Argentina (La Plata) and Uruguay. Aconcagua, Chuapa, Santiago, and a number of other Andes volcanoes are noted. Shows Bolivia with an outlet to the Sea. Mostly depicts modern day Argentina. There is an inset of Patagonia and Tierra del Fuego on the bottom right. Political and topographical features are noted and color coded with elevation rendered by hachure. This map drawn in 1849, the year before Argentina's independence from Spain. Following General Jose de San Martin's defeat of the Royalist forces and the subsequent liberation of Argentina, European and other Latin American settlers flocked to the region with dreams of rich farm lands and other natural wealth.